Brand New Text from Stenhouse! Click the image to order now. We are thrilled to announce that Stenhouse has released our book at the ISTE 2015 Annual Conference in Philadelphia, PA. It's been quite a juggling act -- teaching, going to school, and writing at the same time. But I'm lucky to have a phenomenal co-author (@JenRoberts1) who keeps me motivated to reflect on my practice and write. We've been blogging about our process, and have built out a companion website for the book to support teachers who are studying the text in professional teams, or who would like to connect with us with others as they make the transition to teaching with 1:1 technology in the classroom. There, you'll find a comprehensive study guide that offers chapter synopses, discussion questions, quotes to ponder, and activities for work groups. 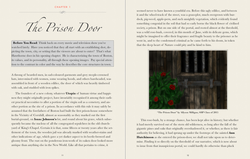 Scarlet Letter Interactive iBook. This is my attempt at both teaching the classics, and supporting struggling readers who would rather read anything but the classics. In addition to presenting a fully searchable, tap-and-define version of the original text (which is fortunately in the public domain), I embedded before, during, and after reading prompts to promote self-explanation while reading. I also partnered with student artists to infuse the text with images, and interviewed colleagues for video footnotes to give students access to content they may not have otherwise understood. "Learning from the Other Generation"
As a student teacher, I had the opportunity to work with two incredible mentors: Heather Lattimer, my master's advisor, and Mary McBride, my master teacher. After working closely for the better part of a year, we realized that there was much in our process that was worth sharing. 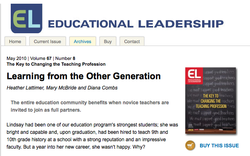 Together, we wrote an article for ASCD's Educational Leadership Online called "Learning from the Other Generation." 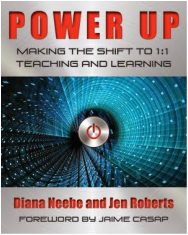 ISTE 2014 and 2015: Jen and I presented "Power Up PD: Top 10 Workshops for 1 to 1" for the annual conference of the International Society for Technology in Education. Abstract: This session is designed as a discussion and modeling of best practices for delivering professional development to teachers new to 1 to 1 teaching. Recognizing that the typical ISTE attendee is a tech leader in his or her school or district, we aim to provide our colleagues with the structure and tools we have used to create a progressive professional development program for teachers new to technology integration. Data-Driven Differentiation. Abstract: Come check out some easy and powerful tools for analyzing information from your students, and for differentiating your instruction. During this session, we’ll explore the tools and pedagogy that support: data collection & analysis, formative feedback, differentiated assessment, and methods to support invisible tiering inside the classroom and out. Sparking Student Curiosity and Creativity. Abstract: Get ready to play! In this hands-on lab, we’ll explore tools that you can use to spice up your lessons, hook your students, and hold their focus. During the second part of the workshop, we will test out content creation apps that will support students in applying their learning and demonstrating mastery in creative ways. Educating in a Digital World 2013: Presentation for the Apple Distinguished 1 to 1 iPad Program School Award. NCTE 2012: "They All Have Laptops. Now What?" Presented with Jen Roberts and Heather Lattimer at the annual conference of the National Council of Teachers of English in Las Vegas, NV. Abstract: Technology ignites literacy when we focus on student learning instead of apps and gadgets. The presenters in this interactive session – two high school teachers, and a teacher educator – will focus on core practices of an ELA classroom and how a one-to-one environment can extend, enrich, and transform those practices. NCTE 2011: "Social Justice and Student Voice." Presented with Heather Lattimer and Namir Yedid at the annual conference of the National Council of Teachers of English in Chicago, IL. Abstract: Literacy flourishes when adolescents are empowered to confront challenges in their communities and the world. The presenters in this interactive session -- a middle school teacher, high school teacher, and refugee educator -- will describe projects that engage students in researching and responding to social justice concerns through art, writing, and film. NCTE 2010: "Real World Literacy: Project Based Learning in the English Language Arts Classroom." Presented with Heather Lattimer at the annual conference of the National Council of Teachers of English in Orlando, FL. *For a complete list of presentations, please see my visual cv.